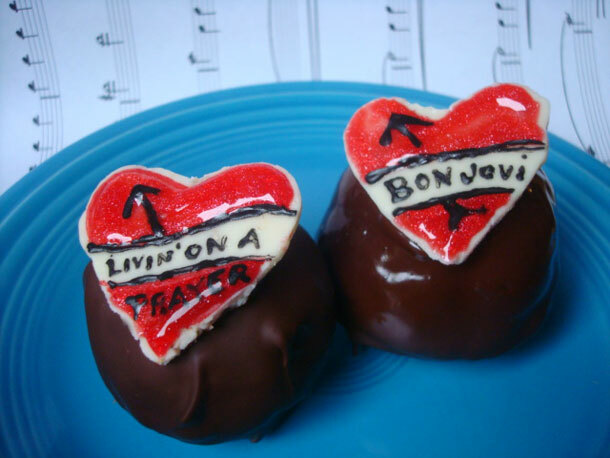 Bonbon Jovi Truffles: they may be slippery when wet, but they don't give love a bad name. Starting with a can't-go-wrong combination of smooth peanut butter and chocolate, these truffles get a snappy "pop" from Rice Krispies. Simple and delicious, these truffles are as addictive of a guilty pleasure as a hit single. They'll make your mouth as happy as singing Living on a Prayer at the top of your lungs with the windows down. Note: I made my toppers using a 1-inch heart-shaped cookie cutter to mimic a Bon Jovi band logo, which is an ornate bleeding heart. If you break some hearts while removing them, don't sweat it—just use some confectioners' sugar and water like "glue" to put them back together. Decorate with writing markers or gel icing with the titles of your favorite Bon Jovi hits. For the full tutorial and post, visit Serious Eats!